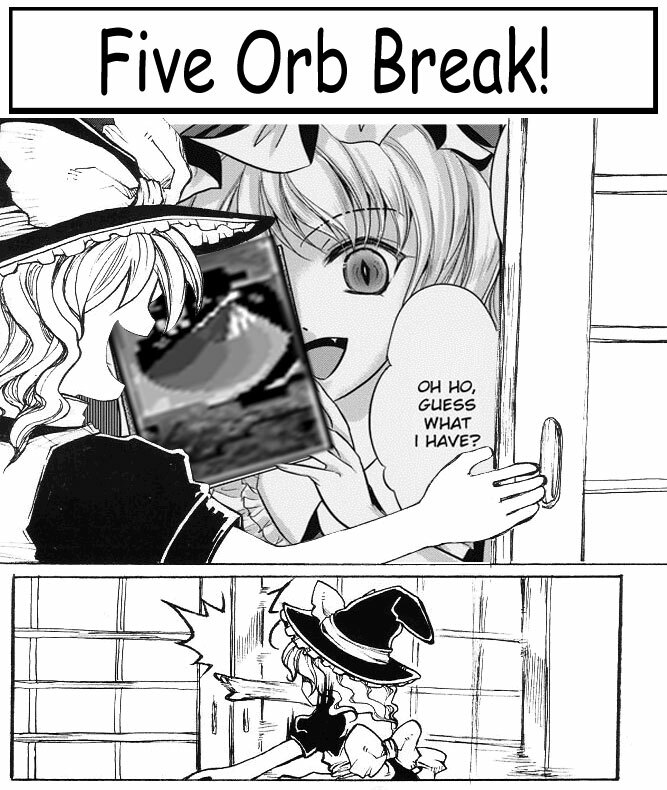 FOB: A Touhou Hisoutensoku Tournament. Sign ups start two hours before the tourney. /query Muii your name to enter. The point of this tourney is so that players can get people to play at least for a certain amount of time. Basically I want you to donate a certain amount of your time to this game. So from 4PM PDT I WANT SOKU TO BE PLAYED. If you think your game is strong, prove it. If you think your game is weak, here is the time and the place for you to get advice and try to improve. 2. Round Robin format, everyone plays everyone. 3. Sets will be best 2 out of 3. 4. Winner cannot change character, but free to change decks. 5. In case of desync, restart the match. If something seems funky about the match, try to finish before restarting. 6. Save replays. Emphasis on this. Send them to me with /query Muii after the tourney. This is for the sake of collection. A replay pack will be uploaded afterwards. I will upload the bracket every once and awhile, it’s your responsibilty to look at it and confirm the scores. Usually this is not a problem because both players agree; however, this is why we have replays. 7. Winner must report match results to #FOBresults. Recommended format: (Winner Name) 2 – (Loser Name) 1/0. Do not use #FOBresults for chatting please. Also keep a personal record of your matches, just in case of human error on my part. 8. In a special twist, we’ll be using a tier list style system. If you win 2-0 you get 2 points, if you win 2-1 you both get 1 point, and if you lose 0-2 you get 0 points. You can be a top tier Hisouten player! 9. In case of extreme lag, if unplayable both players get 1 point and 0 wins, if 1 player has unplayable lag with more than 2 players they are disqualified. 10. Iku grab glitch not allowed. 11. Players can use lobby to play if both cannot host. If both players cannot get connected to each other, each will get 1 point and 0 wins. The Tourney is too disorganized! >Honestly the whole idea was to have a lot of players in one room and get a lot of matches done in a short span of time. This is designed to be a more casual event, just get in the room and play everyone on the list (that I will post beforehand this time). It’s easier on the player if he can set his own pace on matches. The Tourney takes too long! >There’s no helping this. RR with so many people takes forever. At most 3 matches per set, at most 5 minutes per match, and 17 sets equals a very long time. I recommend setting the whole day aside (yes, for a poverty game), eating lunch beforehand, and stretching or something. I won’t be enforcing it, but players are welcome to take a break should they feel they need one, just don’t push like 10 minutes and make the tournament even longer. For the record, last FOB took about 4 and a half hours, with 18 players. If you need an extended break for real life issue or anything talk to me about it and we’ll see if we can work it out. I’m also making it earlier; however, if enough people tell me to change the time I will. 1. Read the rules. YES, sign ups are on the day of the tourney, not whenever you finish reading this. 2. If you come to spec or something, please don’t post your IP in the room, it’s confusing. 3. I’ll be releasing the chart every once in awhile, please keep a record of your matches and confirm with the chart. 4. #hisoutensoku is the place to chat, not #FOBresults. 5. This is a community gathering, if you have any questions please feel free to ask. Ex. Why does Alice vs Sakuya feel unwinnable?, etc. At the end of the tourney everyone will have played you and you have a very good chance of getting feedback. The dumbest questions are the ones left unasked.